This semester, I had the opportunity to be a trainee for Superstition Review, and when they announced a group of interns would be traveling to LA to AWP, I didn’t hesitate to join them in their adventure. Even though I wasn’t 100% sure what AWP really was, I knew I heard of it before in some other conference. I’ve heard that thousands of writers go there to meet, to talk, and to share their love for written words. For someone who can barely pronounce “literary,” going to AWP was more than a fun and glamorous trip to LA. This was a great opportunity to interact with different writers and publishers from all over the world. I had a lot of firsts: it was my first experience with Uber (great storytellers). My first time in my 30’s sharing another room with girls I barely knew, who at the end of the first day I was lucky enough to call them my friends. When you share a passion like writing, becoming friends is easy, unproblematic, and so natural that it seems a little magical. And life sent me the best roommates I could ever ask for, Jess, Alexis, and Leslie! And I realized that when a passion unites us, age doesn’t matter. It was also my first time in a book fair with more than 800 exhibitors. 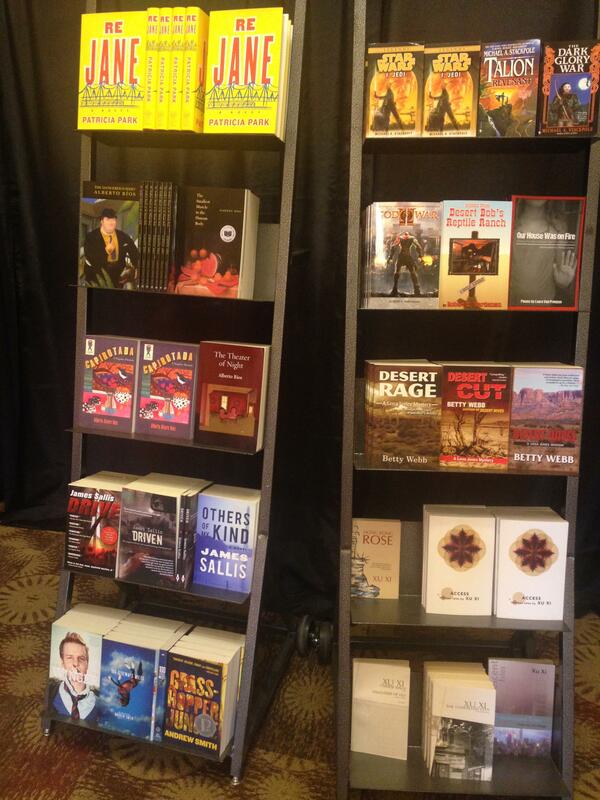 Even though at the beginning, my mind compared it with the Phoenix Women’s Expo, but with authors, literary magazines, and MFA programs, it soon became overwhelming and a little challenging to see it all. However, I was still able to learn new things. I learned there is a bilingual press here at ASU, how did I not know this? I obtained information on MFA and literary presses from around the globe. Also, from the book fair I got different freebies, including enough tote bags to give away to my entire family, and a t-shirt that I was able to use in a non-planned 5k race on Saturday morning. I also was able to start my own pin collection. One of the best parts of AWP (besides having the compulsive feeling of wanting to buy every book, and wondering if the next J.K. Rowling is in the same room) was being able to represent Superstition Review in different ways: at the table giving information about the magazine, being engaged on Twitter documenting our AWP experience, and basically at every moment during the conferences interacting with people. The greatest thing about representing Superstition Review is realizing that I’m luckier than I thought I was, being able to work with Trish, founder and pretty much the soul of the magazine who has attended 13 different AWP conferences, is rewarding and inspiring. I was only for a few hours at the s[r] table, but during that time I had multiple people come by and ask about her; they wanted to meet her, they were excited and honored to be published in Superstition Review, they were grateful to be read and heard. Besides the book fair, there were more than 500 readings and panels. One of the advantages of having multiples panels to choose from is that you can invest your time in topics that really matter to you and contribute with your own ideas. One of the panels I attended to, was Latinos in Lotusland, where I was able to share my opinion about Frida Kahlo not being “cool” in Mexico anymore and I shared my opinion on staying true to our own voices and to not follow what it is “cool” on the market. And my favorite part of this is that I was heard. I was reminded that even though I come from a different culture and I speak another language, I have a story worth telling and that I should never stop my writing spirit. See you in Washington, DC! 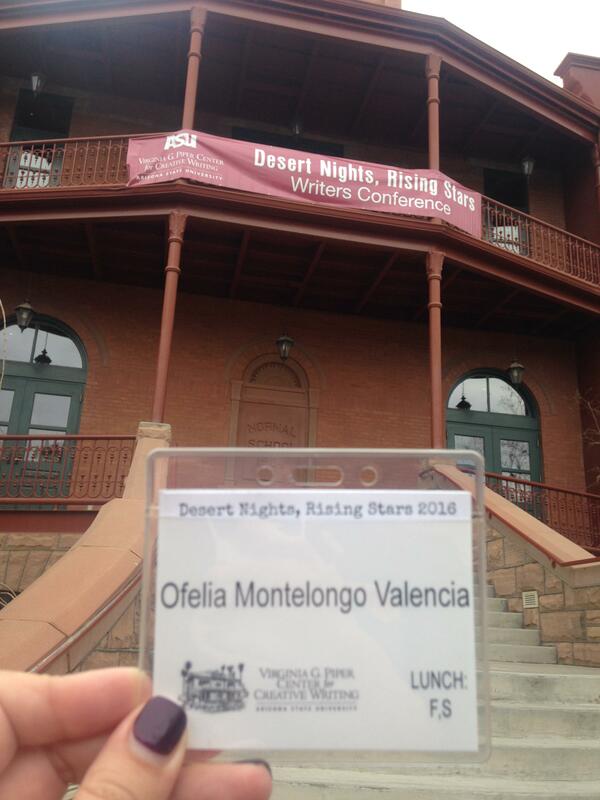 The Virginia G. Piper Center for Creative Writing organizes the annual writers conference Desert Nights, Rising Stars. Every year they bring writers from across the country to a three-day event full of workshops, classes, and readings. This past February was my second year volunteering at the event. And once again, I felt like a groupie when meeting famous authors. After being in the financial industry for so many years, I sometimes feel like an outsider in the writing world. But, one of the main reasons I love this industry is because everyone is interested in you–in your writing and in you as a person, not the company you represent. Being you is important in the writing world. You are the only person that is more passionate about your work than anyone else. It is incredible to be able to meet so many writers at the same place. Being a writer sometimes feels idiosyncratic and isolated, and this event has helped me to see that I’m not the only one that feels that way. I have met wonderful volunteers, attendees, and faculty who I befriended and keep in contact with. There is some sort of magic in being able to talk with the author (Manuel Muñoz) of that book you read a semester ago about craft, endings, and the struggles of being a bilingual Latino writer. There is some sort of magic in reading aloud your work in front of excellent writers like Alice Eve Cohen. There is some sort of magic in being able to see that behind a published book there is a person who is not too different from you. And that they were once in your role; they were once an aspiring author learning the craft of writing. There is some sort of magic in eating lunch with the people you aspire to be like: award-winning writers who just signed their book for you; writers who just told you that success is a mix of hard work and a lucky break; writers who told you that they hope to get your book signed one day. There is some sort of magic during these three conference days everywhere you want to see it; you can even find it in the delicious afternoon snacks. The most important element of this kind of conference is how you feel at the end of it. How you feel during these three days would be worthless if you do nothing about it. If you feel inspired at the end, then it was worth it; you know can go back and keep writing. If you feel discouraged because you learned the toughness of the writing and publishing business, then it was worth it; you know can go back and keep writing. Between MFA readings, panels, conferences, and classes, the magical key that everyone agrees with is that the only way to be successful is to sit and write your best work.